Inclement weather on Monday and Wednesday could not keep the Jackets from spring football practices. Tech normally practices on Rose Bowl Field, but a wet field caused them to move indoors to the John and Mary Brock Football Practice Facility. Practice on Monday featured the Jackets in pads for the second time this spring. Full contact was allowed, and there were 21 periods of 11-on-11 drills. 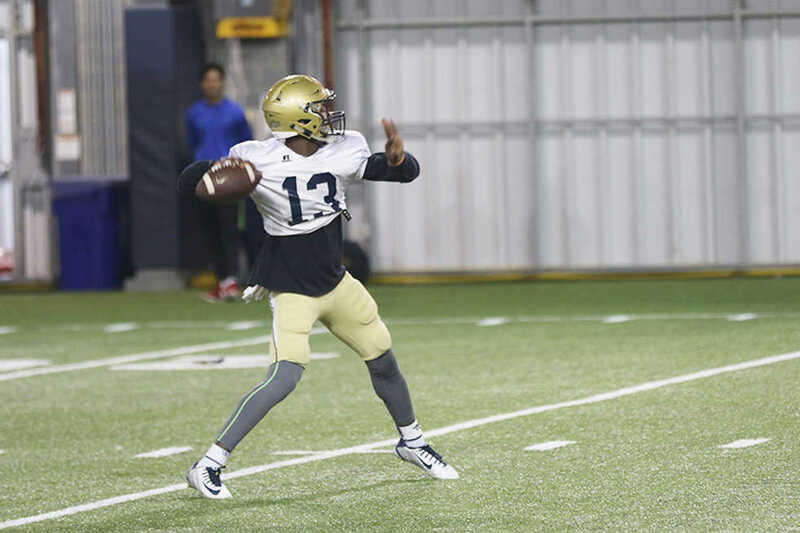 The Jackets are returning several impact players on both sides of the ball, but there was a general focus on fundamental drills throughout the practice, courtesy of myAJC.com. Presumably, this allows for the younger players to keep up, and it helps the veterans focus on their basic skills. On offense, the biggest departure comes with the graduation of quarterback Justin Thomas. Tech fans will not soon forget his tremendous contributions to the program, and he has left some huge shoes to fill. Luckily for the Jackets, the soon-to-be redshirt junior and presumptive starter Matthew Jordan is not shy on confidence. Jordan has rushed 65 times for 243 yards and six touchdowns in his career, and arguably his best moment came in an upset over No. 18 Virginia Tech last season. He started while Justin Thomas was injured, and he rushed 32 times for 121 yards and two touchdowns. During Monday’s practice, Jordan also flashed much improved passing abilities. Jordan found running back Qua Searcy for deep passes, courtesy of ramblinwreck.com. The rest of the offense features an assortment of upperclassmen and younger players. While center Freddie Burden and tackle Eason Fromayan are gone, Parker Braun, Will Bryan and Shamire Devine look to be more than ready on the interior offensive line. At tackle, Andrew Marshall, Kenny Cooper and Jahaziel Lee are all competing to start, the first and last of whom were impressive last year. Leading rusher Dedrick Mills and A-backs Clinton Lynch and Qua Searcy are returning as well. At wide receiver, Ricky Jeune and Brad Stewart are back and will look to be reliable targets for their new starting quarterback. Although Tech will return eight starters on defense, it will no doubt be challenging to replace the production of players like defensive tackle Patrick Gamble and linebacker P.J. Davis. Antonio Simmons, who led the team in quarterback hurries last season (12) is penciled in to start at defensive end. On Monday, Simmons rushed from the left side and came down with two key sacks in the 11-on-11 period. Rising sophomore defensive tackle Brandon Adams also stood out in the padded practice sessions. At linebacker, Tech will likely count on Vic Alexander, Brant Mitchell and Terrell Lewis to take on a much larger workload. All three played in most games last season. In the secondary, the Jackets return all players. Lance Austin, A.J. Gray, Lawrence Austin, Step Durham, Corey Griffin and Shaun Kagawa will all return to their cornerback and safety spots. Kagawa has notched three interceptions in the last week, and Lance Austin added another interception of his own on Monday. So far, the Jackets look to be on the right track in their preparation for the 2017 Spring Game on April 21, a chance to showcase their progress to fans.